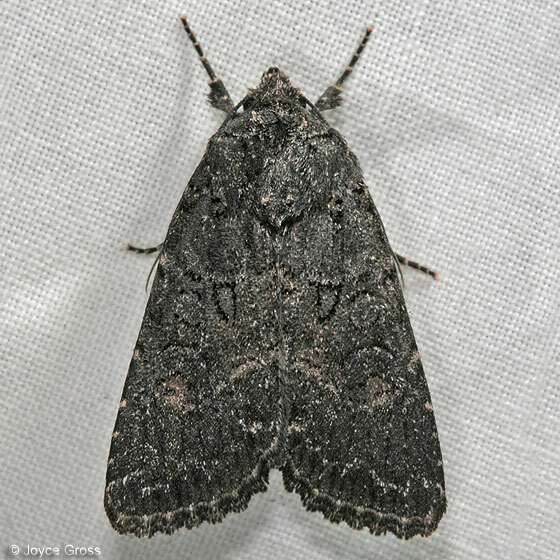 Very dark moth -- I lightened the photo a bit so that the markings would be visible. Moth came to UV light. In Apamea plutonia the reniform spot is larger and edged in white (see photos of both species). There's 20 specimens of fumosa in the California database, with a late date of 29 July, whereas there's only 2 specimens of plutonia, with a late date of 3 June. Several other dark species are similar but IMO don't match as closely as fumosa in one or more details. Still, another opinion or two would be good to have. A specimen from the CDFA collection show the dark spot outlines, especially for the claviform spot which is so prominent in Joyce's photo. Most of the California Specimen Database dates are much earlier, but there are a couple of August dates. It's good to know that we're in the same ballpark, genus-wise. I had looked at that CDFA image and thought the claviform spot was too long, extending past the orbicular spot. But the claviforms don't look quite as long in the perfumosa photos at All-Leps, and their fumosa photos show enough variation to make it a tough call. I made a genus page for this one, and will move it there for now.